When we hear "a squared" plus "b squared" equal "c squared" do we actually picture turning a, b, and c into squares? Well, we should. 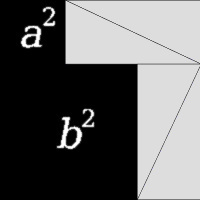 The proof to the left is one of several ways to geometrically prove the Pythagorean Theorem to be true. We must first know that the triangle is indeed right. Watch this video and fill in your notes. Watch this video then use a piece of paper to duplicate this example. How to prove is a triangle is right. 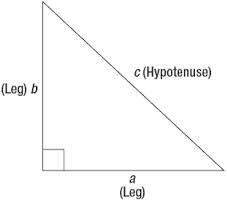 Pythagorean Theorem works only for right triangles we can use it to prove whether a triangle is right. Simply square the two shorter sides and add the areas together to see if the sum is equivalent to the longest side squared. For the example to the right, since the sum of the squares of the shorter lengths were not equivalent to the longer side squared, it is not a right triangle. 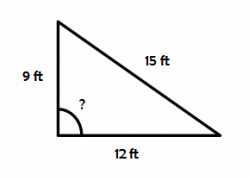 Do the following lengths form right triangles? Just because the three measurements do not show up on the Common Pythagorean Triples list, doesn't mean they do not create a right triangle. You will have to check for yourself.